Today we can see pretty much the ‘politics of man’ in action. Just watch the news every morning to see how man has been fooled into taking a stand for his position as a ‘god in his own eyes’. With some people, insult alone is enough to ‘justify’ destruction of the ‘insult-or’. Man has come to use brutality to atone for brutality. That was not the intent of God when He first placed man on earth in the garden. Peace was the setting for this location. But what happened to so drastically upset this plan? This will lead us into this week’s subject of how ‘man’s politics’ eroded the original plan and has been contributing to this erosion over the thousands of years. ‘God’s politics’ put man in the garden of Eden with all he would ever need and the free will to enjoy it with one exception…’the tree of the knowledge of good and evil’ was to be left untouched…to do so would mean death. No big deal! But God also saw that man was not happy being alone and needed a helper comparable to him. “And the Lord caused a deep sleep to fall on Adam, and he slept; and He took one of his ribs, and closed up the flesh in its place. Then the rib which the Lord God had taken from man He made into a woman, and He brought her to the man.” [Genesis 2:21-22]. This woman was absolutely essential in God’s plan. God determined to make a ‘helper’. Woman’s role in the will of God was to be the helper who was suitable to man in every particular mental, spiritual, emotional, social and physical need. Adam recognized this woman as being his equal…”bone of my bones and flesh of my flesh”. [Genesis 2:23]. This result is what has become known as the universal law of marriage. “Therefore a man shall leave his father and mother and be joined to his wife, and they shall become one flesh.” [Genesis 2:24]. The responsibility for the marriage is on the man’s shoulders…he is to leave his father and mother. The responsibility for keeping the union together is on the man’s shoulders…he is to be joined to his wife. And finally, the union is indissoluble…they shall become one flesh. This was God’s plan…’God’s politics’. But then free will crept in along with all the evil baggage it can carry. Evil became a competitor with good. Also came the accompanying pain and death. 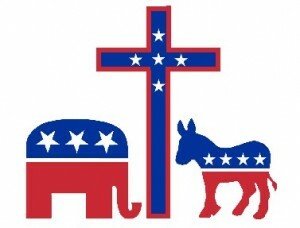 Even long before the Republicans and Democrats, ‘man’s politics’ started competing with the ‘politics of God’. Greed, envy, hate, lust, and power became a main part of man’s motivation. And ‘woman’ who had been given an honored position in mankind slowly sought solstice away from God’s original intent and man failed in his calling thus disrupting God’s original gift of ‘family‘. Of course man in all his ‘knowledge’ knew how to fix things. He would make family optional and would define family in ways that would not offend anyone. In so doing he recognized that the honored position of ‘wife’ was very restrictive. How else to fix it than to introduce women’s liberation. Thus not too many years ago the deterioration of our society was accelerated by the ‘politics of man’, and ‘God’s politics’ were put aside as too restrictive. Man had relinquished his responsibilities to be the head of his household and women lost vision of their responsibilities to the family. God’s plan started to unravel and He has let man work his way into the destruction of those who place their will above that of God’s. More than 50 years later, we know the answer. In 2018 more girls than boys will graduate from high school and with higher grades. Women’s IQ scores are rising faster than men’s. Since 1980, women are more likely to go to college than men…as well as stay and graduate. The average four-year campus is now 55 percent female. Women have better credit ratings. Single women buy homes at twice the rate of single men. More women than men have driver’s licenses. Women are just as likely to win elections as men. Most managers are female. The wage gap has continued to shrink with many women are already making more money than men. By all standards set forth in The Feminine Mystique the women’s movement succeeded. How, though, do the beneficiaries feel about it? Are women now more happy? Since 1972 researchers at the University of Chicago have collected data for a project called General Social Survey. The purpose was to measure the changing attitudes of Americans. Next week we will see how ‘man’s politics’, as focused on ‘equality’ as they might be, come up failing when compared to ‘God’s politics’. God’s plan had men and women supporting each other in the scheme of life, not competing with each other. Happiness does not come with being able to do ‘whatever we want, whenever we want ‘.